John Edmonds, Untitled (Du-Rag 3), 2017, pigment print on Japanese silk, 50 x 40". John Edmonds is a Brooklyn-based artist and photographer whose first monograph, Higher (Capricious, 2018), presents four series made between 2011 and 2018. Edmonds will sign copies of the publication at the New York Art Book Fair at MoMA PS1 at 4 PM on September 21 and will be in conversation with Jessica Bell Brown at the National Gallery of Art in Washington, DC, on September 23. Here, he discusses the origins of each series in the book and his aesthetic choices. THE “IMMACULATE” SERIES marks my first intentional set of photographs. When I was making it, I was employing a language around color and chiaroscuro—very much in connection to biblical or Renaissance painting, which was part of my religious upbringing. Growing up in Washington, DC, I saw this symbology in the classical art in the National Portrait Gallery and the National Gallery of Art, and that was an entry point for me to actually look at art. There’s a connection between intimacy and divinity in my pictures—intimacy as a form of sacredness. The original concept for the book was about a figure ascending from Earth to the heavens, moving through time and space. There are often conversations about how the work corresponds to ideas of gender and black masculinity, but for me the ideas of masks, public, and private are explored in the images. When I made the “Hoods” series I was pursuing my MFA at Yale University and was thinking about portraiture and how the work in “Immaculate” was about this description of skin. I wanted to photograph a hoodie in the same way, to describe it in the same way that I do flesh. I was also thinking about the void of a human figure and the implications of the body underneath the hoodie. Many of the hoodies in this series are my own, and when I first made these pictures I thought of them as an internal between vulnerability and safety. But because of the Black Lives Matter movement and the works’ heightened visibility in 2016 the pictures took on a more explicitly political meaning. The hood cannot be dissociated from racism and racial profiling. The “Du-rags” series, in contrast, is about moving to Crown Heights—a predominantly Afro Caribbean neighborhood, where men walk daily in public with their do-rags flowing behind them. I did not see them as gendered, because often they brought to mind that my mother wore them, too. For me, the do-rags represent this supreme genderless black being in an ephemeral divine state. I’m interested in this softness and ambiguity of gender. The works are printed on silk and take inspiration from the Veil of Veronica, an imprint of Christ’s face and arguably one of the first “portraits” in the canon. I was interested in how the backs of the heads I photographed almost became like imprints of faces on veils. Similarly, do-rags are used to preserve hairstyles; they’ve become these markers of adornment, but they also conceal. There’s also something so incredibly medieval about do-rags when you think about them as headdresses—the silklike fabric, the regality. In the “Tribe” series, I thought about the way Surrealists used African art, and I reimagined those visual references by using masks and statues collected from domestic spaces. The objects and the models have a duality about them; the bodies almost become sculptures in a still life. I asked a friend who is a collector of African art about the objects in the series. I was disappointed to learn they were not from “real” tribes in Africa, but this was an interesting turn in the project. It got me thinking about what constitutes something as “real” or “authentic”—how value is assigned. They’re animated and dramatized, which is partially the purpose of them as objects. In “Tribe,” I am carving out space for this group of people and creating a visual study of ethnography and identity. I am using photography to reassign and reexamine value by creating a sense of community and belonging. 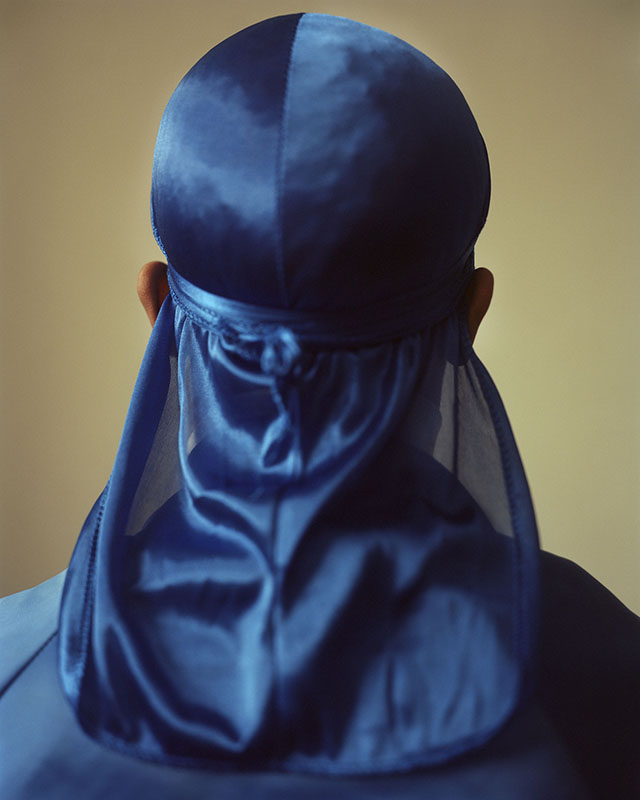 For the book, I wanted the cover to mirror the do-rag photographs, not just through the gold of the fabric but also as a contained object that you’re opening and inspecting the interiority of, almost as if you were looking into a body. As the artist, I often conceal the identities of my subjects as a form of protection. I liked playing with the idea of concealment and veiling for the book as an object. I often work with natural light, which results in this soft, radiant, golden glow on the skin in my portraits, so the gold on the cover also returns to this idea of the sacred. One of my favorite parts of the book is the index’s material quality. At first it feels like newsprint, but then you realize it’s closer to the paper in a sacred book like the Qur’an or the Bible. The paper also allows the images to bleed through. Visually, this ties back in to the idea of opacity—the freedom to live in the world as an individual but also to retain the right to anonymity.